It's not a simple task to get from Montepulciano to Rome on public transportation, but doable. We caught the little orange bus (Urbano) to the big bus station just outside the village. 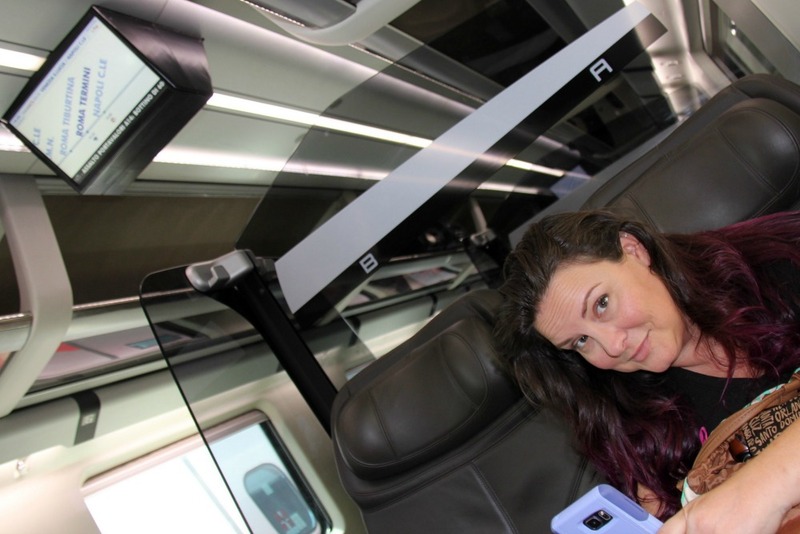 The big regional bus delivered us to the train station in Chiusi, (Qzee) about 25 km from Montepulciano, where we boarded the train to the main terminal in Rome (Roma Termini). We jumped on a City Tour bus to get an overview of historic Rome. Jen taking photo of the Colosseum. Her pretty purple hair shines brightly in the photo, but really it was a cold, rainy day. Rome always and forever provides a feast for the eye, architecturally and otherwise. The Italian flags fly in the breeze and someday I'll figure out what this building is. Ok, now I know what it is. 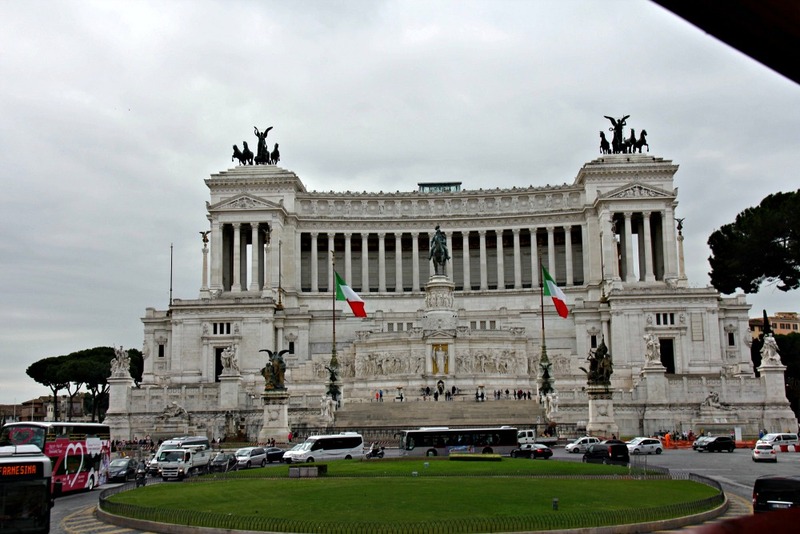 Variously derided as "The Wedding Cake" or "The Giant Typewriter," the Monument to Victor Emanuel II—Rome's blindingly white elephant of a commemorative pile of marble devoted to modern Italy's first king. What do I know? I find it impressive! Tourist walking to Trevi Fountain. Looks like a romantic place for lunch, right? Probably not, as several thousand tourist per hour will be walking right behind you on the the way to toss their 3 coins in the fountain. Jen securing her promise of a return to Rome, which she did about 3 weeks later on a return trip to Italy. She went home to California, got a hurry up passport for her son Michael and came back again. Lunch: Jennifer's Choice....she's eaten at many Hard Rock Cafe's from Cancun to Rome. Jen's burger and inset is yet another burger she's had at another HRC in South Lake Tahoe. Leaving Rome for a few days in Naples. Jen was eager to return to Naples after 14 years. 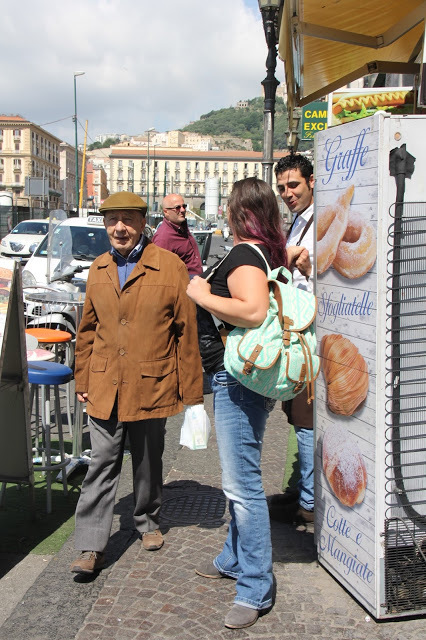 She lived in Naples for four years and her son, Michael was born there. I'm otherwise known as CameraHead. See what I mean. Jen enjoys taking of me taking photos. Here we are seeing the sights of Naples. We were there for the Guinness World Record for world's longest pizza. This was at the boardwalk on The Bay of Naples. It was 2 km long and Italy beat it's previous world record. Roof Tops in Naples as seen from hotel rooftop pool and lounge. Pretty Jennifer, catches the eye of a Neapolitan...men in Naples act like you've heard about Italian men. Young men, old men, makes no difference...a pretty girl is a pretty girl and their appreciation of her must be expressed! Waiting for train from Rome back to Montepulciano.